Lily family perennial with long, fleshy leaves which grow directly out of the bottom of the stem. Its flowers are red, white, and sometimes yellow. It originated in north and east Africa and grows in tropical and subtropical climates. Nowadays, it is mainly grown in South Africa, Latin America, the Caribbean and in the Canary Islands in Europe as it requires a temperature above 10ºC and many hours of sunlight. There are more than two hundred species of ALOE. However, the varieties that have the most properties are ALOE BARBADENSIS and ALOE VERA. The juice is extracted from the leaves of these plants. The plant takes 4 or 5 years to reach maturity and attain all its properties. Aloe Vera maintains the skin’s natural moisture. The plant protects itself from drying out in the sun and does the same on our skin. Aloverose and other carbohydrates in the plants’ leaves are perfect storage vehicles both for the plant and for our skin. 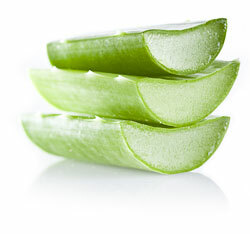 They keep our skin completely hydrated just like the lush Aloe Vera leaves. Our skin is constantly renewing itself. Aged cells are sloughed off and new ones are created. Pure Aloe Vera juice stimulates this natural constant regeneration process and gives new cells huge reserves of nutrients. Skin mostly ages because of cell oxidation. Pure Aloe Vera juice contains a wide variety of antioxidants which counterattack cell oxidation: Vitamins A, C and E, minerals, essential fatty acids, and secondary herbal substances such as saponins and sterols. This slows the skin’s aging process and naturally prolongs skin’s young and glowing appearance. This plant from the lily family has been known to man since 400 B.C. for its moisturising and healing properties. Cleopatra looked after her skin and maintained her famous beauty with pure Aloe Vera juice. Nowadays, no other plant contains more regenerating substances, such as vitamins A, B, C and E, minerals, amino acids, enzymes and valuable polysaccharides. All these substances from the Aloe Vera plant included in our cosmetics stimulate the metabolism, natural regeneration and irrigation of the skin’s tiny capillaries. Aloe Vera looks after, protects and regenerates our skin. Its “miracle” ingredient is germanium.